FFWPU Oceania: The earliest memory of my education about God through the Principle was the morning after attending my first evening program in 1981. That night we took a long bus ride into the Northern California hills and I woke up the next morning on a farm known as Booneville. In the morning I was talking to a group of young strangers when one showed me a picture of himself with a very large tuna that had been caught in something called “Ocean Challenge”. Now as someone who had been a fishing fanatic since young, any movement (I didn’t know it was a church at that time) that went fishing couldn’t be too bad. True Father’s investment in ocean activities is unprecedented for a religious leader. Humans are made for the land. To go out on water is outside the comfort zone physically and socially. Through history, men and women have been willing to do this but the point of difference of True Father’s investment was its spiritual dimension. His primary motivation was to lay spiritual conditions in the Providence of Restoration to create a God centred future. Great providential events during True Father’s life were always supported by conditions laid while conducting fishing activity. It is fitting therefore to remember our True Father through an ocean based event on the third anniversary of his ascension. 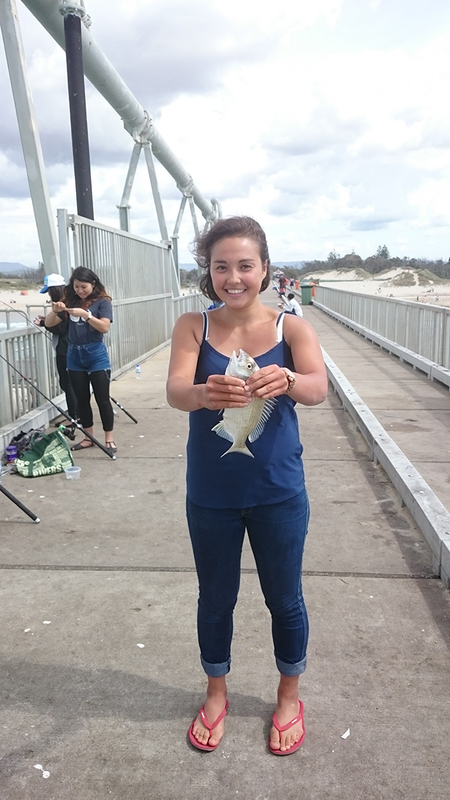 To that end a family fishing event was held on the Gold Coast, Queensland on Sunday 6th September 2015. 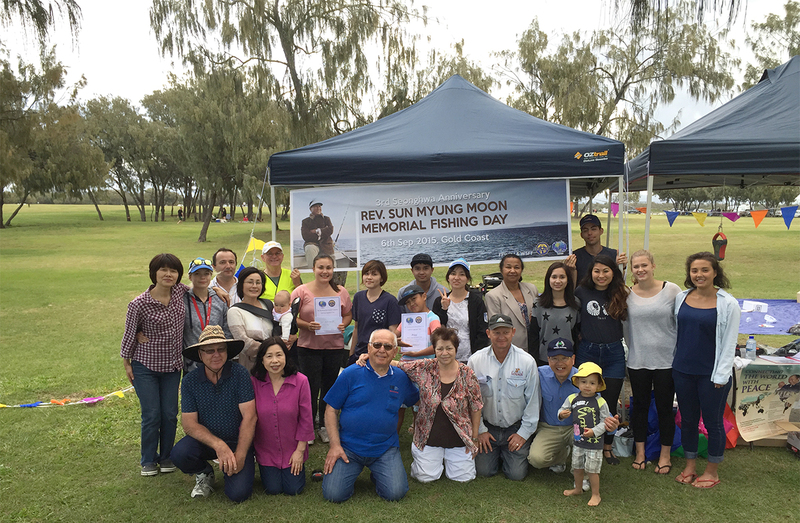 This is the second annual Family Fishing Day and was attended by 25 friends and family of the Family Federation for World Peace. The event was sponsored by the World Sport Fishing Federation (Oceania) including cash prizes. Mr. Arai came from Melbourne for the event and also donated prizes for the fishing competition. To prepare for the event Mr. Arai offered 7 days fishing in the week leading to the event and Kim offered 40 days fishing during the 93 days leading to the event. The venue was a jetty which extends into the ocean at Main Beach, Gold Coast. The weather was perfect for the event as participants mingled with beach lovers, dog walkers, surfers and other recreational fishermen fittingly on Father’s Day. . Following an exciting morning of fishing, we were blessed that most participants could catch at least one fish. We then adjourned to a BBQ lunch and awards presentation. For the second year running the major prize for the heaviest combined weight, was won by a young woman. Dana Priesner, a visiting second generation member from Germany who had the heaviest combined weight with 4 bream (1.415kg) and took away $150 and a seafood box. Further prizes were given for female, child, heaviest fish and participants lucky draw. Paul Saver, had the heaviest fish a .527 kg trevally and also the lucky draw prize. We thank everyone who helped planning, preparation of banner, cooking, set up, and participated in this highly successful event. We look forward to continuing this local tradition and extending and broadening in the future.